I dumped my RAM DIMM info. It contains string like 32GB(8Gbx4DR). I know its size is 32GB. What does 8Gbx4DR mean? And I heard about the concepts like rank, channel, bank. I understand that a rank is the chips that make up the bit width required by the memory controller channel. And rank is made of banks. But how can I map the dumped info to these concepts? This is a server board. Each CPU has 2 memory controllers. Each memory controller has 3 channels. Each channel can support 2 slots of DIMM. DDR* requires 64-bit channel width. and x4 means a single DRAM chip provides 4-bit width. So 16 DRAM chips are required per RANK to meet the channel width. And if include the ECC (Error Correcting Code), there needs more DRAM chips. For a single byte, a single ECC bit is needed. The DDR* requires 64-bit width for a rank to serve a channel. And x4 means a single DRAM chip has 4-bit width. So a rank will comprise 64/4 = 16 chips. 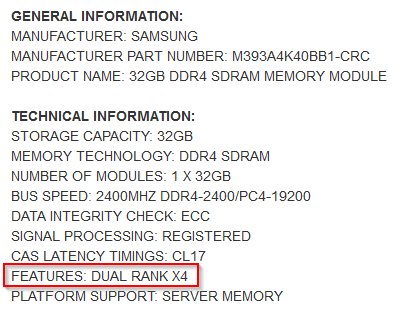 With dual ranks, we need 32 DRAM chips. To achieve a total DIMM capacity of 16GB, the size of each DRAM chips should be 16GB /32 = 16*8 Gb /32 = 4 Gb. Each 8 bits need a ECC bit, so 16GB needs: 16*8 Gb /8 = 16Gb. ECC can be implemented with DRAM chips as well. And 16Gb is just 4 pieces of 4-Gb DRAM chips. So in total, we need 32 + 4 = 36 4Gbx4 DRAM chips. 256 gigabits / 8 = 32 gigabytes. The number of bank resource a DRAM contains (density) is internal to the DRAM and not consequential here. It is factored into [DRAM SIZE(in gigabits)]. there is a performance advantage to having more bank resources per dram, since a dram can only have one page (or row) open per bank at any given time. In general, a x4 will perform better than a x8, which will perform better than a x16 (all other factors being equal) due to pipelining of transactions performed by the memory controller. This is because it takes time (latency) to open a page (activate) and close a page (precharge). You can effectively double the number of bank resources on a channel by adding a rank, but this is less beneficial than doubling the bank resource of the dram due to the fact that only one rank can communicate on the bus at any given time. Can I upgrade my motherboard to 32gb of RAM? Can registered ECC memory go into a desktop mother board? How to find out what is the “best” RAM for me? What exactly is the cause of RAM incompatibility? GA-H97N-WIFI upgradeable to 32gb Ram?